Debuting countries: Belgium, France, Germany, Italy, Luxemburg, The Netherlands, Switzerland. Disqualified: UK: Ev’rybody falls in love with someone - Denis Lotis & The Keynotes, UK: Little ship - Shirley Abicair, Denmark and Austria. The winning song was written by Géo Voumard and Émile Gardaz. Inspired by the Italian Sanremo Festival, the idea to organise an European competition for light music was born at a meeting of the European Broadcasting Union in Monaco, back in 1955. It was decided that the first ever Eurovision Song Contest would be hosted the following year in the Swiss resort of Lugano. Lohengrin Filipello was hosting the programme, which lasted 1 hour and 40 minutes. The seven participating countries were represented with two songs each. The songs of the contest were not to exceed three and a half minutes, and the performers were accompanied by an orchestra of 24 musicians, led by Fernando Paggi. The interval act, whistling by the Joyeux Rossignols, had to be extended due to a delay in the voting procedure. This first contest was mainly a radio programme, though there were cameras in the studio for the benefit of the few Europeans who had television. The backdrops behind the singers were, perhaps understandably, not very lavish. No video recording of the entire event is known to have survived, although an audio recording does exist (although 20 minutes is missing from the end of the first part of the interval act till the start of the announcement of the winner). 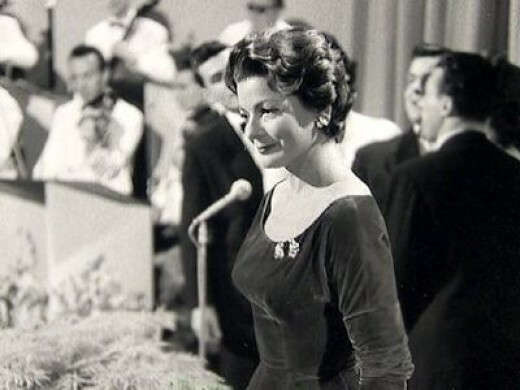 Newsreel footage of Lys Assia's encore performance of Refrain appears to be the only known video from the contest. Only solo artists were allowed to enter the contest. Groups were banned, a rule which would only be abolished in the 1970s. Most of the performers were women, although Germany used two men. Luxembourg television was in a financial crisis at the time. As well as being unable to afford two singers, it decided against the expense of sending two jurors to Lugano. One rule of this contest is that every country had to have a national final, this rule was dropped in future years and some countries chose to choose a song internally. It had been strongly recommended that each participating country have a preliminary national song contest. Austria, Denmark and the United Kingdom were disqualified from the final contest, however, as all of them registered after the official deadline. The BBC's Festival of British Popular Song, which had been intended to choose the United Kingdom entry, was in the end not held until after the Eurovision contest. All participating countries sent two jury members to Lugano to vote secretly for the songs, except for Luxembourg whose jury members could not make it to Lugano. The voting system at this Contest allowed juries to vote for any competing song, including those of their own country. Additionally, the Swiss jury was allowed by the EBU to vote on behalf of the Luxembourg delegation. This is a system which was not repeated, and is believed by some to have tipped the result in Lys Assia's favour. There was no scoreboard and the voting was kept secret. Except for the winning song, the results have never been published. Simon Barclay's book The Complete and Independent Guide to the Eurovision Song Contest 2010 includes a table with what appears to be the results, but the author doesn't give a source and under the chart he writes that "the votes awarded have never been disclosed".